Organisations struggle with a number of problems related to collecting and maintaining accurate data required by their business processes. The manual processing and routing of paper and electronic communications is costly, slow and error-prone. Mail errors impact line of business process efficiency and effectiveness, and visibility into mailroom performance is insufficient. These combined with other common challenges highlight the need for an automated approach to the management of a multi-channel mailroom. An increasing number of organisations have recognised the efficiencies gained by transferring mailroom tasks to a dedicated provider, including envelope opening, sorting, validation, scanning, data capture and routing. getsix® Digital Mailroom solution provides a streamlined, auditable mail process that eliminates lost or unaccounted for documents. The key to mailroom efficiency is converting paper into digital documents and automating onwards processing of critical mail items. getsix® Digital Mailroom solution allow you to centrally capture, route and process mail items by merging all incoming information into a single mail handling process. 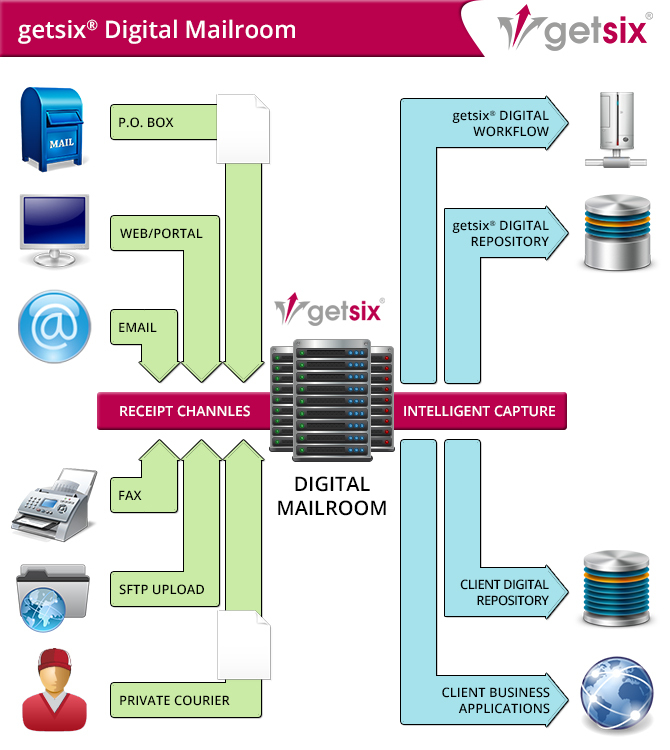 Why choose getsix® for automating your Digital Mailroom? Together with our F&A outsourcing solutions our customers have the possibility use an industry leading Digital Mailroom solution without any financial upfront Investments. With our getsix® BPO Approach we will identify together with our customers the different possibilities in the deployment of such a solution to increase their work productivity. Automating routing of mail items into business workflows. You can choose how you to receive your digital mail – as email, on mobile devices, through file transfer or via our electronic document management solution realised with MS SharePoint. Using high-volume production scanners, along with a combination of manual data entry, automated form classification and data capture systems, getsix® convert thousands of paper documents every month into useful digital information, delivered quickly and efficiently to the right people at the right time. getsix® Digital Mailroom solution incorporates time and cost-saving lean and six-sigma efficiency, along with quality improvements for inbound and outbound mail, and all associated business processes. Automated form classification and intelligent data capture solutions offer benefits for all industries, including healthcare, banking, insurance, transportation and logistics. What Technology we are using? At getsix® we are using KOFAX technology – one of the best integrated platform in the industry – to provide our Digital Mailroom solution. KOFAX can process all types of documents, at any point in a business process. Therefore, we can extract accurate metadata and correct any errors, from any location. Through automated process management and customer communication, so high-value, high-cost business processes begin or progress effectively. 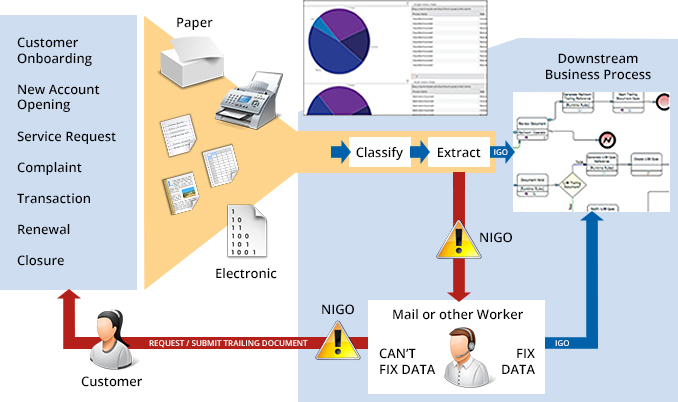 Extension of business rule validation to the customer, line of business or any other point where knowledge resides to perfect Not-in-good-order (NIGO) documents. With KOFAX TotalAgility Mailroom automation, processes that took days and weeks of iterative corrective action can be triggered and resolved in minutes. KOFAX is a double leader in the two key capabilities needed to make effective mailroom automation a reality. Rated by Forrester Research as leaders in both Multichannel Capture and Dynamic Case Management, so getsix® can be confident that our partnership with KOFAX will help achieve the benefits of our mailroom automation solution. For more technical Information about KOFAX KTA please view: Business Process and Dynamic Case Management. All business processes need accurate information to be executed effectively and efficiently. KOFAX TotalAgility Mailroom Automation users benefit from a completely automated business process that perfects the information that organisations capture from any source, for virtually any customer lifecycle touch point and transaction type. Better Quality of Information Achieve the highest information quality across revenue-driving customer touch points, allowing business processes to perform at speed and with reduced errors and risk, improving customer satisfaction, generating greater customer loyalty and increasing lifetime customer value. Control and Visibility Gain complete control and visibility of document and information entry as a holistic process that succeeds before line of business processes begin or progress. Responsiveness to Performance Issues Capitalise on actionable insights and take steps quickly to meet service level expectations and overcome mailroom performance issues. Faster Validation Accelerate document validation and information correction processes using better automation and more productive involvement of knowledge workers or external constituents, including customers. Compliance: Tailoring an end-to-end solution to your organisations specific needs and the compliance requirements of your sector.